HomeHealthA Magic Potion For Fat Loss! If there were ever a magic potion for fat loss – it would be water. Our bodies are comprised of about 70% water. We lose about a litre (34 ounces) of water per day under normal circumstances and when the temperature in our body rises, as during exercise, we lose higher amounts of water through sweat. It only makes sense that we need to continually replenish this supply for water is necessary for nearly every function in our body. Water regulates our temperature, supports and protects our organs, helps with digestion, transports nutrients to our muscles and helps move along waste by products. Water is, in essence, the key to fat metabolism. Here’s why: one of you liver’s primary functions is to metabolize stored fat to be burned for energy. If you are dehydrated, the kidneys cannot function properly and the liver begins to take over – as a result of working overtime, the liver metabolizes LESS fat so MORE fat remains in your body. Sometimes we mistake mild states of dehydration for hunger. If we don’t get enough fluids, our bodies give us indications that are similar to hunger pains. When this occurs, we start eating because we misunderstood what are bodies were telling us. Unnecessary calorie consumption can lead to excessive fat! Water is a natural appetite suppressant. Drinking lots of water throughout the day helps to keep you feeling full. If your stomach feels full – you are less likely to overeat! A constant supply of water is vital before, during and after a workout. Dehydration leads to a lack of energy, muscle fatigue and cramping. Even small amounts of water loss can hinder exercise performance. Remember that alcohol and caffeine are diuretics, making you lose even more water, so be sure to compensate for the additional loss. How to do it: You can replace the water lost during a typical day by drinking a minimum of 6-8 8 oz. glasses of water a day. Begin by drinking your first big glass of water right when you wake up. Drink a full glass of water with each meal. Keep water with you at all times. 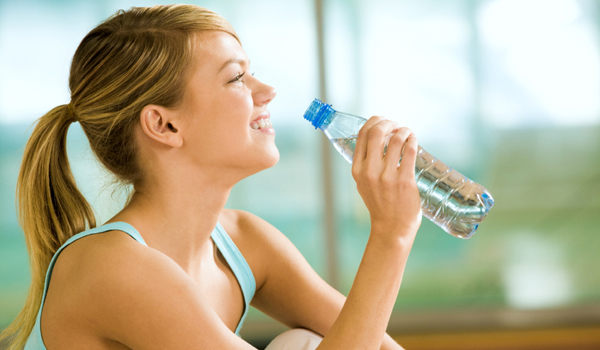 To prevent dehydration, make sure you’re drinking adequate amounts of water before, during and after a workout. As a rule of thumb, drink 8-12 ounces of water at least an hour before beginning to exercise, 8 oz during exercise and 8 oz when finished. If you are hungry about an hour after eating, try drinking a glass or two of water – you maybe misreading thirst for hunger. If you are still hungry after 15-20 minutes then proceed with a supportive snack to tide you over until your next meal. – Make drinking water more fun by adding a slice of lemon or lime. Drink water out of a frosted mug or colourful glass. Grab-n-go flavour packets add variety to water between meals. Keep a bottle of water in the car at all times. At work, pack an allotted number of bottled water and set a goal to finish the pack by the end of the day. – For those who tend to prefer carbonated beverages to plain water try sparkling water. Not only is it crisp and refreshing, it satisfies the need for carbonation. Just make sure you choose a sparkling water that does not contain sugar or fruit juice to avoid additional calories. So if your goal is fat loss, combine a total body strength training program, supportive nutrition and some interval training with your magic fat loss potion and you’re destined for success!